Are Vanguard Mutual Funds dying? I see in this thread many advantages of ETFs enumerated, and also many advantages of mutual funds. Every investor will value the pros and cons differently, so there is no objective answer to whether any given reason is “enough”. Sure.. but for a buy and hold investor, that invests in total market and doesn't sell till 65 years, what is the advantage of ETFs? Other than convenience of auto investment? In other words, what is the advantage besides all the advantages that people have already listed? What, exactly, are you fishing for? If you believe there are no hidden charges not reflected in mutual fund expense ratios, then you are absolutely correct and Edelman is dead wrong for claiming there are. If you believe the mutual fund industry is perfectly transparent and there is no room for improvement, then Edelman is dead wrong for fighting for more transparency. If you believe things like transaction costs don't eat away at mutual fund performance (especially for active funds), then Edelman is dead wrong for saying they do. I'll keep an open mind. I do believe there are hidden charges. I believe the best way to evaluate hidden charges is to see long term performance (especially after tax), and to look at turnover rates. Indeed, there's no other easy way to evaluate bid-ask spreads or market impact from trading. For brokerage fees, I am not even sure these are easily quantifiable (and could be easily gamed) -- many fund firms (like Fidelity) have their own brokerage units. I wouldn't object to their disclosure, but there are worse things in the MF arena and far worse things in the FA arena. I'd be more impressed if Edelman didn't have some of the highest fees in the FA business. Last edited by SlowMovingInvestor on Thu Mar 14, 2019 9:21 am, edited 1 time in total. The thing that makes me angry is that, yes, Ric Edelman in theory has a point: all mutual funds should be required to disclose their trading costs, directly, in dollars. But instead of aiming this attack where it might be deserved, he specifically targeted Vanguard index funds, by name, which are in fact the part of the mutual fund industry that least deserves it. One of the characteristic of a cap-weighted index fund is that it requires minimal trading and thus incurs minimum transaction costs. So the attack is, in fact, dishonest. His agenda is not to reform an aspect of mutual fund practice. His agenda is to attack Vanguard index funds, and he does it by raising an issue that might apply to some mutual funds but does not apply to Vanguard index funds. No argument here. Edelman's attack, from over a decade ago, was corrected and removed from his podcasts. It was a misdirected attack, for sure. Out of all the mutual fund companies, Vanguard probably deserves such criticism least of all. Seems like it was 6 years ago, not a decade. Last month, at a talk at the IndexUniverse Inside ETFs conference, personal finance adviser and media personality Ric Edelman told roughly 1,300 attendees that he had challenged Vanguard to disclose trading fees in their fund prospectus. This came roughly one year after Edelman accused Vanguard of hiding 1.4 percent trading fees on his radio show where he stated "so in addition to the .06 percent, add another 1.4." It is also a ridiculous and dishonest attack when the guy says he's not given any consideration to the argument that we can easily see the true costs of an index fund by comparing it to the index that it is tracking. And this from a guy who is charging "wrap" fees of up to 1.75% , invest $1 million with him and he'll skim off nearly 1.4% per year ($13,875). In addition to the fees above, which include costs for trading and custodial services, clients pay roughly another 30-35 basis points for the mutual funds or ETFs in which their accounts are invested. Purchase $200 worth of VTI at the opening bell today and let us know how it goes. Try investing a $200 initial investment in any admiral shares fund at the opening bell and tell us how it goes. I'll admit, a mutual fund just has more of the 'feel' of an investment as well. You are right that the Roth article was six years ago. My point, which you apparently missed, was that Roth immediately used Edelman's statement from twelve or thirteen years ago as ammunition in his attack on what Edelman said six years ago. Edelman already retracted his older statement. I don't know why anyone would worry about hidden mutual fund fees, or fees not exposed by the expense ratios, or increasing transparency in the fund industry. Sales loads paid to brokers and recurring fees paid to their account executives and to registered investment advisers are other major drags on fund returns. Most individual investors in actively managed funds rely on these distribution-related services to select their fund investments. But because the costs are paid directly by investors rather than by the funds themselves, they are ignored in the published performance data. Changing distribution patterns in the fund industry make it challenging to estimate these amounts with precision, but they must be part of all-in cost measurement. So, it would seem your dispute is with anyone who dares question the multi-layered hidden fees so prevalent in the mutual fund industry, including Jack Bogle. Edelman was overzealous in his arguments, since Bogle only estimated the increase in fees hidden from view as being from "1.12% for actively managed large-cap mutual funds . . . to an estimated 2.27%". So, it would seem your dispute is with anyone who dares question the multi-layered hidden fees so prevalent in the mutual fund industry, including Jack Bogle. My argument at least is not with anyone who questions hidden industry fees. My argument is that given Edelman's attacking Vanguard, his past history of disdain for index funds and his 1.4% fees for $1M+, he is not remotely credible as some crusader against fees. Whereas Mr Bogle was credible. Also, neither you nor Edelman has refuted the simple fact that comparing the index against the actual returns of the fund is the best way to get at these hidden fees. I still await the counterargument to this. The ER of ETFs is what pays for whatever costs the manger has, whether it is the website or customer service (what customer service does an ETF provider even offer). In just about every conceivable way, the costs of an ETF are more transparent than an equivalent mutual fund. Please point to an actual annual report to substantiate your claim. The bold bit is the point. The ETF does not provide customer service. The broker provides the services so the cost is not in the ETF's ER. The services are still used and the cost still needs to be paid. If you think all broker's fees are transparent see this thread. The cost of ownership of a Vanguard mutual fund is the expense ratio. The cost of ownership of an ETF is the expense ration plus the (apportioned) cost of the brokerage account they are held in. I don't disagree with that. I would not give Edelman my money to manage for those high charges, but I won't dismiss things he says that do have merit. He has a history of thousands of statements over fifteen or twenty years, so picking out a couple and throwing out everything else he said because of them seems ridiculous to me. Actually, Jack Bogle did it quite effectively in the quotes (and linked articles) I provided. Perhaps give them a read. The fact that an ETF has no customer service costs doesn't mean they are hidden: it means there aren't any. Not the same thing. Brokerage costs (hidden, transparent, or otherwise) are an entirely different discussion. Again, there's nothing to be gained by conflating two different things. If you have a brokerage account, whatever you hold in it is going to be subject to the fee schedule of the broker whether ETF, mutual fund, stock, bond, CD, futures contract, etc. But if a new customer wants to buy either a Vanguard mutual fund or a Vanguard ETF, they will have a brokerage account. Vanguard forces a brokerage account on all new customers even if they only want mutual funds and to buy anywhere else would also require a brokerage account. I prefer mutual funds myself, but I don't see any significant difference in terms of hidden costs with either an ETF or a fund. Neither do I see any way in which the cost of ETFs are more transparent than a mutual fund. I do think it is easier to compare an index mutual fund to it's index to see the true cost as there is no spread or discount/premium to potentially complicate things. But what I would like to know is how are the costs related to customer service, etc. paid when the customer holds ETFs at Vanguard? Vanguard's brokerage somehow covers the cost of all the free ETF trading that they offer. Is it all covered by the spreads? If not how are they doing it? 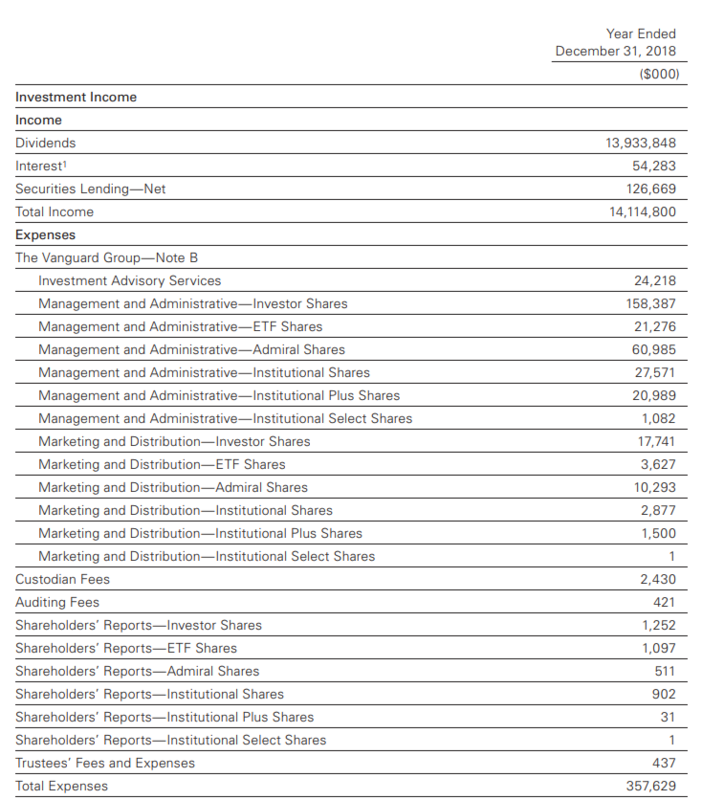 Looking at the annual report for VTI/VTSMX, etc., it does show marketing and distribution expenses for the ETF on the page copied below. Does marketing and distribution cover the customer service and brokerage costs for VTI shares held at Vanguard's brokerage, while for shares held elsewhere those costs are born by the brokerage at which they are held? But even if this is the explanation for Vanguard's own ETFs, Vanguard brokerage is offering free trading of all ETFs, how are costs covered for the non-Vanguard ETFs held at Vanguard? But if a new customer wants to buy either a Vanguard mutual fund or a Vanguard ETF, they will have a brokerage account. Exactly. This is an important point. For one thing bid/ask spreads are fully transparent in ETFs but virtually invisible in mutual funds. In an ETF, the investor making the trade absorbs the bid/ask spread whereas in a mutual fund the investor making the trade gets (more or less) a free ride while existing shareholders bear the cost. Brokers have many revenue streams, and capturing some of the bid/ask spread is one of them (assuming they can execute the trade internally on their own desk). They make a spread between the rate they pay on money market and sweep funds and what they can earn by investing those funds. They make money by lending securities that their investors hold. Some transactions have explicit fees, of course. Mutual fund and ETF managers can pay brokers for distribution. True, but I was thinking of it in terms of reviewing the past performance of the fund/ETF relative to it's index to determine the true total cost. It's this that I think may be marginally easier to do for an index mutual fund than for at least some ETFs. It may also be easier to compare index mutual funds from Vanguard to the comparable index funds from others and see whether a difference in ER carries through to actual investor returns (though this is complicated by changes in the ERs). With ETFs, to do this sort of comparison I would, in addition, have to review whether there are differences in spreads and discounts/premiums. If you're looking for total true cost to the investor on an ETF, generally speaking the total return from closing price to closing price is probably the appropriate metric. Because the closing price is (almost always) the last traded price it is as good a number to use as any: it already reflects the bid/ask spread and premium/discount for the ETF. Same for the mutual fund. Plus, for virtually all of the ETFs a buy-and-hold investor would want to compare, the bid/ask spreads are minuscule. Even infrequently traded market cap weighted index funds (say, VIOV for instance) generally have bid/ask spread of less than 0.1%, so incorporating an explicit penalty for that spread distributed over 5-10 years becomes a literal rounding error. For ETFs that are infrequently traded the fidelity of closing prices becomes more of an issue. I own an ETF (ISZE) that sometimes goes days without a single trade, so the closing price is often quite stale. In those cases I agree that the ETF might be harder to measure over short periods. Over longer periods, it still tends to be a wash.
Again, there's nothing to be gained by conflating two different things. Exactly, you are conflating the cost ownership of a mutual fund the cost of running a ETF. Two different things. And is is clear that the customer service costs are hidden. They have been pointed out several times and you still deny they exist. Perfect camouflage. I really don't understand why this is so hard to grasp: ETFs are not hiding customer service costs. To the extent an ETF manager even HAS any customer service costs, they are entirely contained within the fully disclosed and completely transparent expense ratio. It sounds like the windmill at which you are tilting is that brokers are not fully disclosing their fees. That's a different topic altogether. That is not the point I am making at all. I have to congratulate the investment industry on once again finding a way to hide costs from many investors. You seem to be sure the industry is hiding something that you are only imagining. I don't know how to make it any clearer that this particular conspiracy theory has no basis. I prefer mutual funds myself, but I don't see any significant difference in terms of hidden costs with either an ETF or a fund. Neither do I see any way in which the cost of ETFs are more transparent than a mutual fund. 1. the two related differences from transacting ETF shares intraday with third party market participants not the fund, namely potential bid-offer and premium/discount to NAV whereas MF shares are bought and cashed out at NAV. That's not a free ride for everybody, as was pointed out the MF practice of cashing in/out at NAV can cost either non-selling holders or the purchaser/seller, depending on any difference between 'NAV' and *true* fair value. As in, the premium/discount to NAV at close of ETF shares doesn't mean the NAV is absolutely cosmically right and the market price wrong, just that they are different. Often it's because the ETF shares are at an actual premium/discount to true fair value. But it's also often because components of the NAV calculation have out of date prices and in times of stress it can be because the NAV contains estimated, non-realistic prices. 2. the fact that you can put Vanguard ETF's in a brokerage account with Interactive Brokers (with no maintenance fees if your scale is reasonably large) and borrow against them in a personal liquidity emergency at a reasonable rate. You can't do that with MF shares, and Vanguard's margin rates are consistently higher than IB's though not as bad as most other retail brokers. I don't have a systematic preference personally. Most of my assets which are either MF or ETF are MF. I do think it's valuable to have some ETF for reason 2. And if I were to buy more stock for cash (which I basically don't in 'distribution' phase, and can also adjust my position with index futures in tax deferred where necessary) I'd probably go ETF. But I don't see a compelling need to convert my Vanguard MF shares to ETF shares in the same funds (where possible) as a non-taxable event, and there's no way I'd sell appreciated MF shares and pay capital gains tax just to shift to ETF's. Same question. If I buy an index now and sell it in 50 years, why wouldn't be better the ETF if it has a 0.01% lower ER? Why would I want ETFs in my after tax accounts? How do I know which ones are actually more tax efficient? If making periodic investments, I will lose some of the returns of the ETFs by having money stuck in a settlement fund (anything less than one full share purchase). That's virtually unquantifiable. Actually that impact is easily quantifiable. The median ETF has a share price of about $68, and the return differential between an aggressive asset allocation and money markets is about 4.5% per year on average. So the cash drag from not being able to buy fractional shares might be $3.06 per year. In an account with a balance of $75,000 that's 0.004%. That's assuming you don't do anything to mitigate the expense, like invest in a cheaper ETF or find one of the many brokers that DOES allow you to purchase fractional shares in ETFs. Since every ETF has a different per share price, the amount of lag is not known. Each purchase is different. You can "estimate" all day long, but it will not reflect the actual lag. So, you "might be" losing an average estimated $3.06 per year, if your account has a $75,000 balance. Mine doesn't, but yours might. If the ETF loses money in that time period, you will actually end up ahead with the little settlement fund drag. The real effects are unquantifiable. Everything is just a poor, imprecise estimate. Now I'm just not sure that you know the definition of "unquantifiable". In any event, anyone using this concern as justification for choosing mutual funds over ETFs is just looking for something to latch on to. It's an irrationally small cost that is also easily avoided. There's nothing wrong with preferring mutual funds, so there's no reason to make up problems with ETFs. Not made up when the problems exist, whether you like it or not. Since the exact amount of each investor's lag cannot be known, and will vary over time and with each amount deposited, it is indeed unquantifiable. Making up estimates based on average this and probable that might make someone feel good about their math skills, but it doesn't address the heart of the issue. The bottom line is that both mutual funds and ETFs have advantages and disadvantages. Irrationally small differences like 0.01% annually is, indeed, not worth worrying about. This is absurd: just because you don't know how to quantify something doesn't mean it is "unquantifiable". I can forecast the cash drag from uninvested cash in my portfolio with extremely high precision, and can calculate the effect in the past to a fraction of a penny. You can too, since I showed you how. Plus, I don’t see how you should ever realistically have more than ~$150 or so in uninvested cash since that’s roughly the price of VTI. We always say “invest as soon as you have the money” so if you reach the price of VTI without needing to buy any of your other ETFs, just buy a share of VTI and be done with it. Yep, and one share of something like iShares Core S&P Total U.S. Stock Market ETF (ITOT) is only $64 or so. That is simply nonsense. There are plenty of ETFs that cost over $100 per share. VOO is over $259 right now. You could have up to $258.99 sitting in "cash" for months if you want to purchase that ETF. You are left estimating things you cannot know, although you can precisely guess and exactly suppose. Pretend otherwise, if you insist. That doesn't make it true. That just makes it virtually unquantifiable, since you're still just estimating. Many of the factors cannot be known precisely until after the fact, although you are claiming otherwise, such as what rate will be paid by a settlement fund. Perhaps that level of guessing suffices for you, but I'd prefer to go another route, such as mutual funds. To each his own, which is the beauty of the dual system. Someone else pointed out that they believe they can exactly quantify it as it applies to them. Maybe 'exactly' is a little much, but you can get a general idea how much this affects you. I didn't mention it in my 2 points about how *Vanguard MF shares* differ from *Vanguard ETF shares* because it slipped my mind, because it's not relevant to me. I'm in 'distribution' phase, and spend dividends. More than being non-quantifiable, the importance just varies depending on personal situation. To reiterate my two points. 1 again was the vagaries of buying/selling ETF shares from market participants rather than the fund, ie premium/discount and bid/offer. This isn't strictly against ETF's but probably tends to be in the situations and attitudes of most people here, I would guess. 2 was the ability to borrow against ETF shares as a source of standby liquidity for which you don't have pay (as in drag from holding more cash in an 'emergency fund' or fees to have a HELOC), *one* source of back up liquidity that is, doesn't have to be the only one. However if one refuses to consider this idea, for whatever reasons rational or otherwise, then it's not relevant. If the comparison is not Vanguard MF v Vanguard ETF then I think it's useful to state exactly what is being compared. Again in the V to V comparison the tax efficiency point is not valid: the tax efficiency of MF and ETF shares of Vanguard funds which offer both share classes, is the same. In some other comparisons there can be a tax efficiency difference. But an .01-.02% ER advantage (some Vang ETF's v Admiral Shares of same fund) is also real, albeit small. That is simply nonsense. There are plenty of ETFs that cost over $100 per share. VOO is over $259 right now. You could have up to $258.99 sitting in "cash" for months if you want to purchase that ETF. If you don't want to have $259 in cash drag, just buy an ETF that costs less than $259. Vanguard may choose to convert mutual funds that have an equivalent ETF to ETFs. Target Retirement Funds and Life Strategy Funds could easily use ETFs as their underlying investments. Converting active mutual funds to ETFs may not be so easy. Will the crack IT department at Vanguard be able to make the transition from mutual funds to ETFs smoothly? Sure, just buy an ETF you don't want so that you aren't leaving money in your settlement fund earning next to nothing. In fact, keep buying ETFs you don't want at lower and lower prices, until you have almost nothing left in the settlement fund. Or, just admit that the settlement fund provides a virtually unquantifiable drag on performance and move on. It sure isn't rocket science. It's just common sense and simple math. Has Vanguard actually come out and said that they prefer ETFs over mutual funds? Or is all of the speculation going on in this thread simply due to a recent 0.01% expense ratio difference? Mark Twain wrote: “In the space of one hundred and seventy-six years the Lower Mississippi has shortened itself two hundred and forty-two miles. That is an average of a trifle over one mile and a third per year. “Therefore, any calm person, who is not blind or idiotic, can see that in the Old Oolitic Silurian Period, just a million years ago, next November, the Lower Mississippi River was upward of one million three hundred miles long, and stuck out over the Gulf of Mexico like a fishing-rod. “And by the same token any person can see that seven hundred and forty-two years from now the Lower Mississippi will be only a mile and three-quarters long, and Cairo and New Orleans will have joined their streets together, and be plodding comfortably along under a single mayor and a mutual board of aldermen. About two weeks ago Vanguard issued a paper on how to get started with investing. In the past, such a paper would have focused on mutual funds and might have mentioned ETFs as an alternative means to the same end, but this paper focused exclusively on ETFs and didn't even mention the existence of mutual funds. There was a time when Vanguard had mutual fund accounts, and only if you wanted to buy and sell ETFs or individual stocks would you be required to open a brokerage account. Now, Vanguard has forced everyone to open brokerage accounts. ETFs are certainly being pushed by Vanguard. I read one of the linked articles. It basically says that ERs in mutual funds don't capture the full costs of funds (correct), but that passive funds (such as index funds) have much lower such costs (also correct). In no way does this come close to refuting the argument that comparing the index against the actual returns of an index fund is the best way to get at any hidden costs. It is certainly no argument against using index funds, as Edelman says. And there are a number of reasonable etfs that have a share cost in the 20s. So one can buy one of those if cash drag is really bothering you. Yes, you are right. The closest we can come to exposing hidden expenses is to view the historical returns. That doesn't include things like redemption fees, and it is not necessarily predictive. When Bogle and Edelman make the same point, perhaps we should listen. When they disagree, I'll go with what Bogle said. There is no dispute that index funds are almost always the best choice for investors. Doesn't bother me. I have the funds I want with zero cash drag. So can you. It doesn't bother you because your cash drag is hidden in your mutual fund. Vanguard Total Stock Market Index Fund Admiral Shares (VTSAX) holds, by my calculation, nearly three times the cash (as a percentage of assets) that iShares Core S&P Total U.S. Stock Market ETF (ITOT) holds. A cost that you don't know is there is still a cost. And yet, 15 year return for VTSAX is 8.94% vs. 8.6% for ITOT. Interesting data point, but not really relevant to the topic under discussion. Perhaps the supposed cash drag is the thing that is irrelevant? Both VTSAX and ITOT are cap weighted total stock market funds that hold nearly every investable U.S. stock. You claim that ITOT is the superior product because it may hold less cash. How is it superior when it's returns have been inferior during a bull market (a time when cash should negatively impact returns)? To restrict the comparison to the bull market, look at the 10 year returns of 16.66% for VTSAX vs. 15.96% for ITOT. To the extent that's accurate and really matters*, it would be equally true comparing the ETF's VTI and ITOT, the former being the ETF version of VTSAX, the ETF shares comprising ~85% of the value of that fund, MF and ETF being just different share classes of the same funds (where there are both) in the Vanguard structure. A lot of the points made on this thread have been like that, really about one particular fund v another, not a pure comparison of the MF and ETF forms. There are several past threads comparing various minor differences in ITOT v. VTI/VTSAX. *secondary debate there's no point in belaboring IMO.